Well, I'm glad I'm not the only one who hasn't made any vintage pledge progress! To be fair, I have made a disastrous toile of my tunic, but I went to cut it out of my final fabric the other day, I realised that I didn't have enough. Back to the drawing board! Argh, I hate when that happens! At least you realised before you started cutting out ;o) Good luck for future #vintagepledge makes! ooh that's going to be lovely! Hehe, I sure hope so! I am so excited to be going next weekend. It will be great to see everyone's finished outfits. I am working on a little something to wear too, hopefully it will be finished in enough time. Yay, glad you're coming along! How are you getting on with your make? Thanks Nicole, yours is looking mighty lovely too! 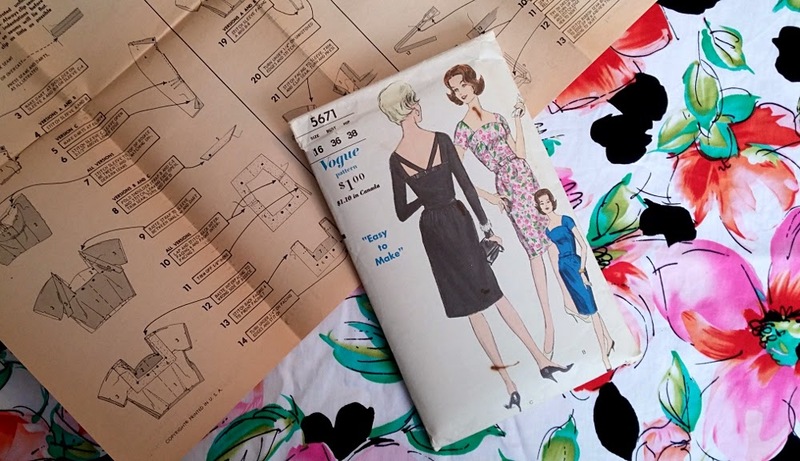 I have had setbacks with my first vintage pattern (Vogue repro V8812, a 1940s sundress, so I haven't made any progress either, but the year isn't over yet! Thanks Tania, I hope so! Ooo I love the fabric and pattern combination! I'm coming to the meet up, so hope to see you there! What an amazing pattern - that fabric is going to look gorgeous!! Very pretty cant wait to see the finish product. Thanks, hope I do it justice! Pattern and fabric look gorgeous! Can't wait to see how it turns out! I'm excited to see the result! Thumbs up here for no fitting issues! Going well so far and very nearly finished!